Shoulder injuries are commonly encountered by athletes who perform frequent overhead or throwing motions such as divers, basketball players, or pitchers. One of the most common shoulder injuries is a SLAP (superior labrum anterior to posterior) tear or injury to the area that encircles the shoulder socket, and serves as the attachment site for the ligaments that stabilizes the shoulder, as well as the biceps. If a SLAP tear is considered following an appropriate history and physical, advanced imaging is often the next step. Plain X-rays are typically normal. MRI with contrast dye placed into the joint (MR arthrogram) has been shown to be more accurate in the diagnosis of a SLAP tear. 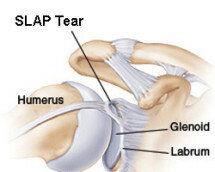 The treatment of a SLAP tear depends on a variety of factors. Often, a trial of non-operative treatment is the first step, including rest, anti-inflammatories, activity modification, and physical therapy. In throwers, a complete 6-week rest period along with physical therapy, followed by a graduated throwing program is typically undertaken. Occasionally, a cortisone injection may be utilized to minimize pain. In situations where non-operative options don’t work, arthroscopic surgical options can be used. Arthroscopic SLAP repair can be performed with a few small incisions and minimal soft-tissue trauma. Complications from this procedure are rare, but include infection, bleeding, injuries to vital structures, and failure of repair. Post-operatively, patients are often in a sling for up to six weeks. Physical therapy is started early on. The focus of therapy includes normalizing range of motion and strength while protecting the repair. Return to sports or a throwing program is typically around 4–6 months. Outcomes from isolated SLAP repairs are often very good. Outcomes are worse with a simultaneous injury, especially one of the rotator cuff. Most studies report improvement in pain and function following SLAP repairs, with greater than 80 percent of throwing athletes returning to their previous level of activities. Older age has been associated with worse outcomes following repair. In conclusion, SLAP tears are a common injury in athletes. Treatment usually is non-operative at first. Outcomes following arthroscopic surgery are often very good, but worse with older age. Return to sport following repair is typically 4–6 months..